Durban, South Africa - Star paddler Matt Bouman claimed his fifth win in the current Discovery Sunglass Hut Surfski Series at the KwaZulu Downwind to Toti in "hectic" surf conditions which ultimately changed the race to a strong "upwind" paddle. The "surf ski rocketing down huge wave" photo posted earlier on surfski.info sparked plenty of interest. Here's the story behind the shot. 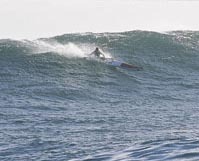 It was taken in 2004 on a Big Day at Dungeons outside Hout Bay here in Cape Town. Someone at SA Paddler magazine thought it might be interesting to take some photos of surf skis catching runs at Dungeons, and looked around for some truly insane paddlers to take up the challenge. Four intrepid surf skiers answered the call: Greg Bertish, Richard Kohler, Richard Sutton and Johann van Blerck. Oh, and the photographer was in a little 15ft aluminum "tinny" with a 15hp outboard... No rubber duck or jetski; just a fast ski boat as a makeshift rescue craft.